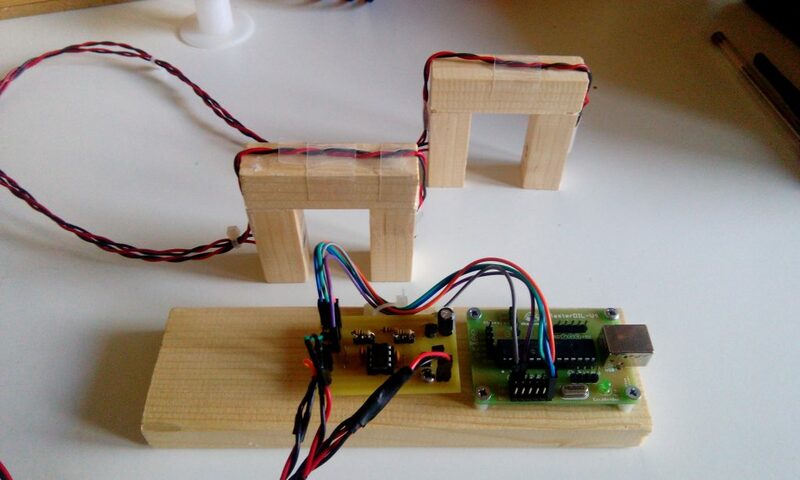 Two “general purpose” photodiodes, two LEDs, some front-end electronics for photodiode reading, and a Theremino master are the tools to create a pair of photogates that can be used for many educational demonstrations in the field of the kinematics. There are so many solutions available on the market (hardware + software) but they are very expensive. What we propose is something that can really be achieved with a few tens of euros and it allows us to obtain all-important performance with the possibility of carrying out many experiments of kinematics. In the two images below you can see the two photogates. 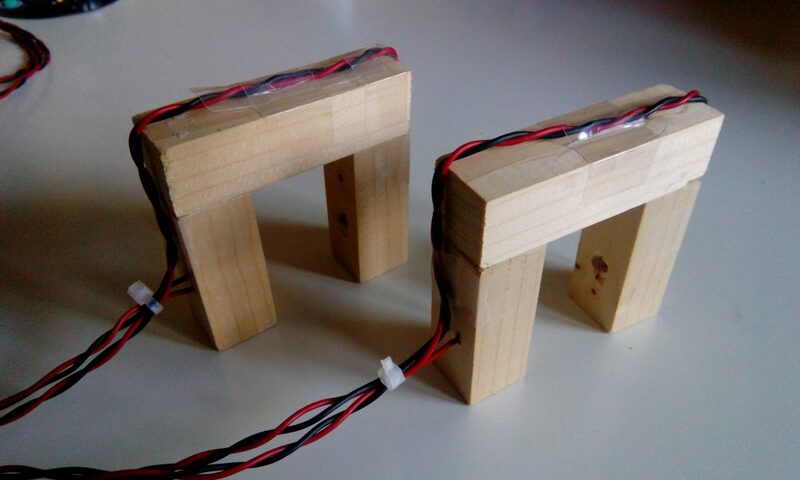 In practice they are made up of two small columns made from rectangular section wood sticks, drilled to accommodate the photodiode and the LED and glued to a third wood block that holds all aligned and gives stiffness to the structure. To keep the LED-generated beam collimated, it is convenient to keep the LED inside the hole and do not put it outside, of course the photodiodes and LEDs must be optically aligned. 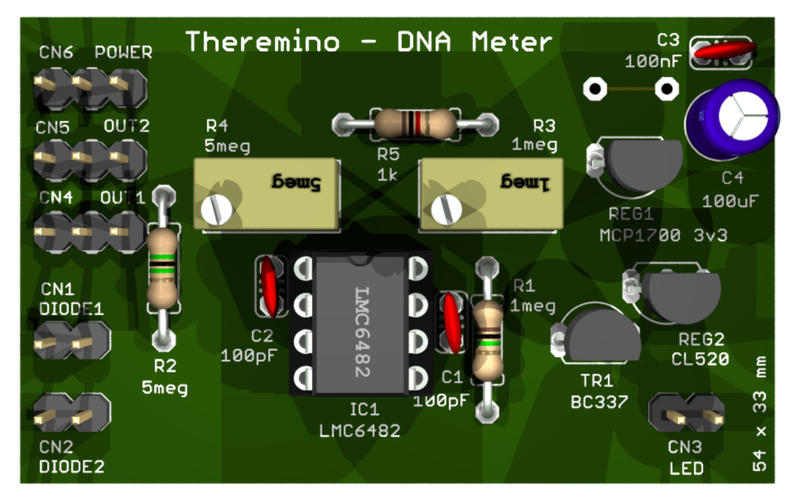 The two photogates are connected to a readout electronics that includes the amplifiers of signals produced by photodiodes (trans-impedance amplifiers), the constant-current LED driver, and of course the Theremino Master for data logging. The figure below shows the two photogates with the readout electronics. 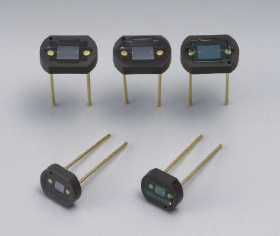 The chosen photodiode is the S1133 Hamamatsu model, “general-purpose” model, already used for other applications. Of course, the best one would be a photodiode with infrared sensitivity peak and an infrared LED, doing so greatly reduces the ambient light input, thus increasing the signal / noise ratio. The high sensitivity of the photodiode and the opportunity to adjust the gain of the amplifier still allow the use of almost all types of photodiodes and LEDs. 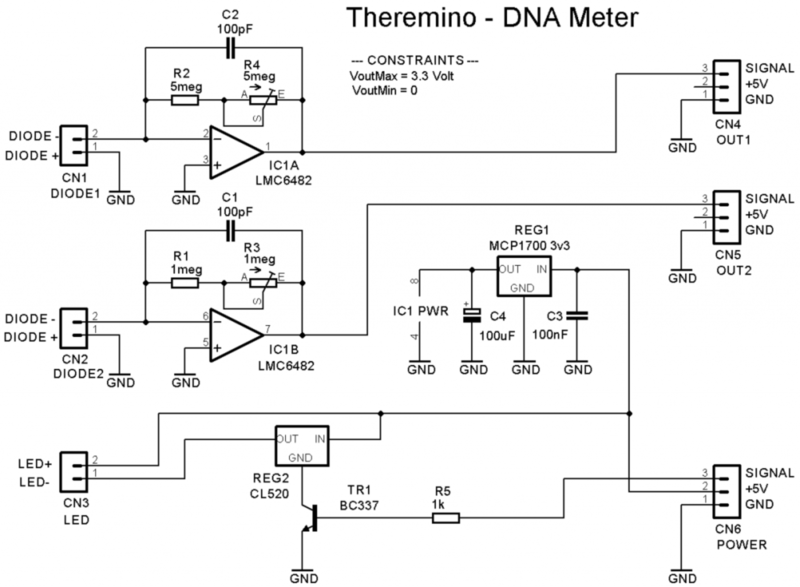 To acquire the photodiode signal, it has been used the trans-impedance amplifier already used for the fluorometer described in the post DIY Fluorometer for DNA Concentration. A constant current generator (suitable for LEDs) has been used to drive LEDs. The picture below shows the circuit diagram. Circuit rendering with photodiode connectors (bottom left), LEDs (bottom right), and connections with Theremino Master. 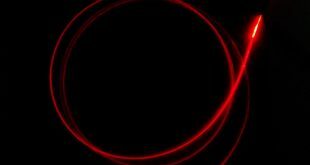 The first application of the photogates is the study of the accelerated motion of a ball that takes place on an inclined guide. In the picture below you see the inclined guide, on which a meter of paper was placed. The ball is placed at the top end and dropped along the guide. 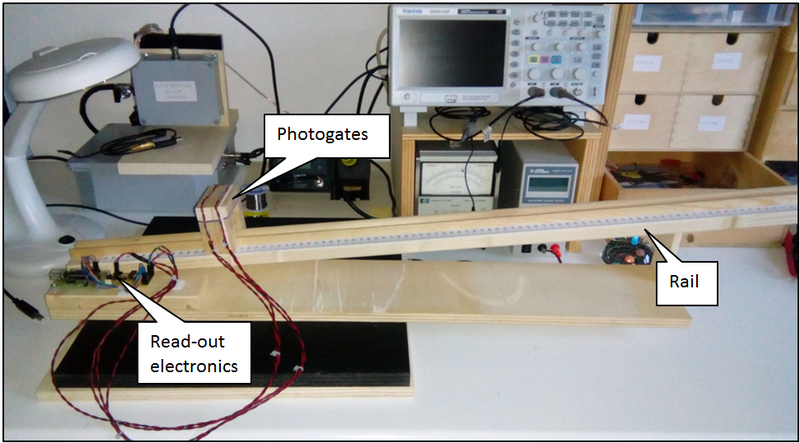 The two photogates are placed in contact so that from their signals we can obtain the ball speed at the intermediate point between the photogates. 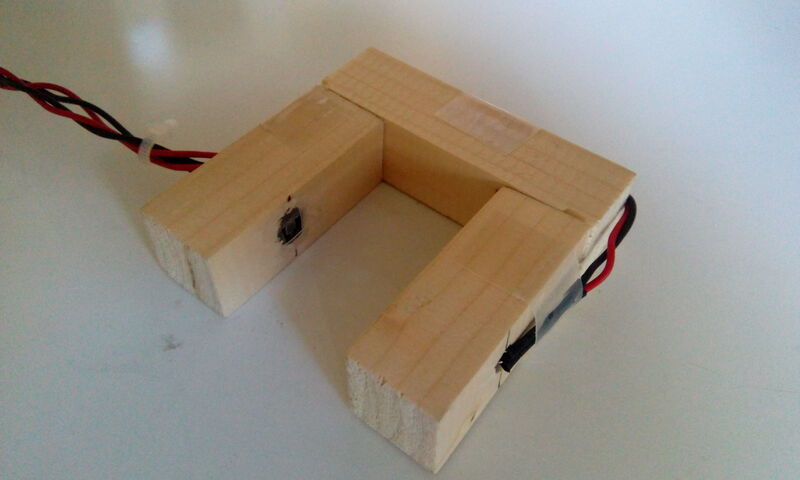 Measurements were made by positioning the photogates at increasing distances from the starting point of the ball. The signal acquisition takes place via the Master Theremino connected to a PC. On the PC, the HAL application, which allows communication with the Master, and the SignalScope software, enable the logging and display of the signals from the photodiodes. SignalScope works both as an oscilloscope and as a Data Logger and this allows you to easily view the trend of both fast and slow signals, and measure the time intervals of interest. The two images below show the SignalScope screens with the signals from the photodiodes (blue line and red line), where the signal interruption corresponding to the transit of the ball between the photodiode and the LED is evident. In the second image, you can see the time sliders positioned at the falling edges to measure the time interval. The measurements of the transit times allowed to calculate the velocity of the ball in the various positions where the pair of photogates was placed. 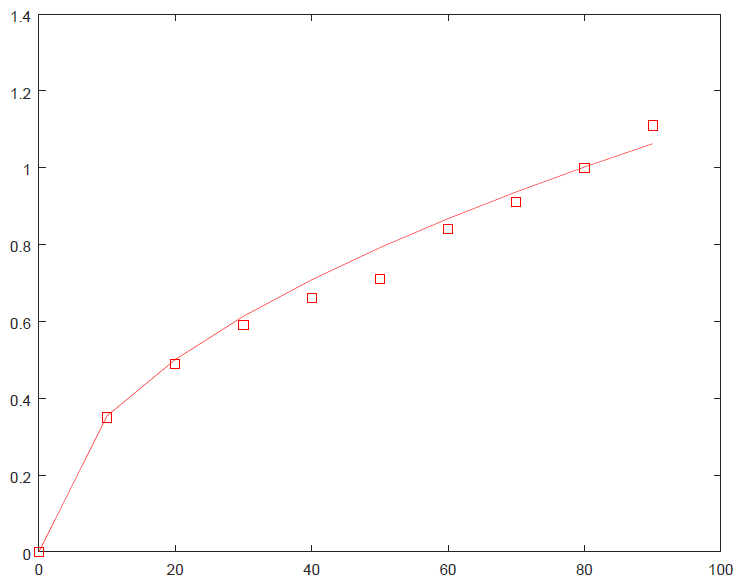 The graph below shows the results obtained. 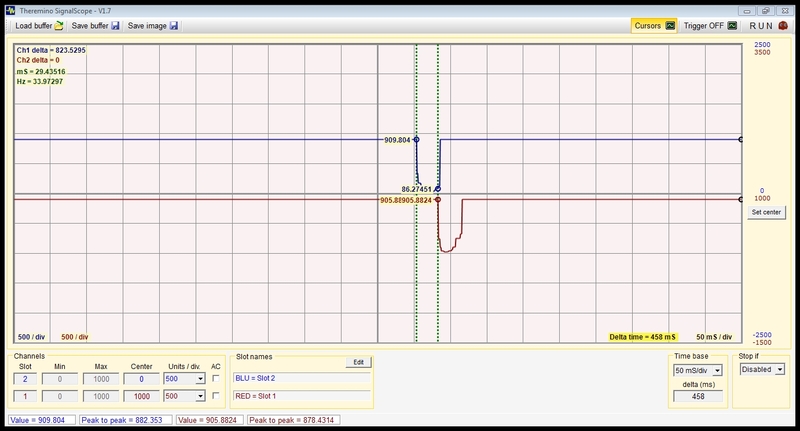 To obtain the “fitting” we used the open software Gnu Octave. As you can see in the chart aside the fitting is rather good, even if not perfect. 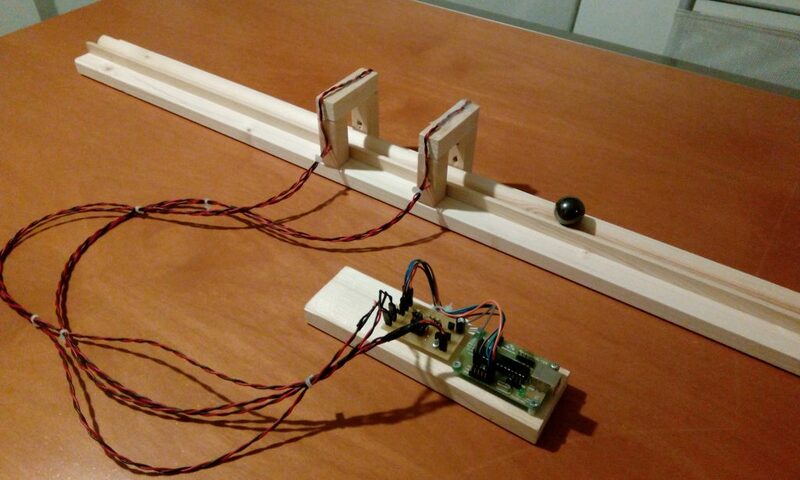 The value obtained is a little lower than the correct value of 9.81 m/s2 , probably also due to the friction between the ball and the wooden rail. By doing more accurate measures you can probably improve the agreement with the correct data. The photogate is therefore a valuable aid to the study of kinematics.